Oxidative stress due to the overproduction of reactive oxygen species plays an important role in the pathogenesis of various diseases. 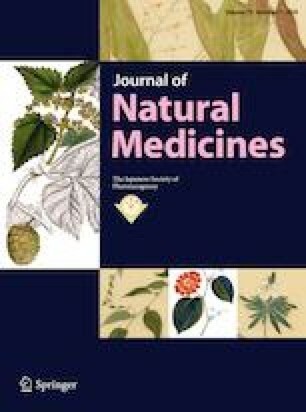 In the present study, we comprehensively evaluated the antioxidant activities of 147 oral formulations of Japanese traditional herbal medicines (Kampo medicines), representing the entire panel of oral Kampo medicines listed in the Japanese National Health Insurance Drug List, using in vitro radical scavenging assays, including the 2,2-diphenyl-1-picrylhydrazyl free radical scavenging activity assay, the superoxide anion scavenging activity assay, and the oxygen radical absorption capacity assay. Three of the formulations tested, namely, Tsudosan, Daisaikoto, and Masiningan, showed the most potent in vitro antioxidant activities and were selected for further investigation of their intracellular and in vivo antioxidant effects. The results of the 2′,7′-dichlorodihydrofluorescin diacetate assay demonstrated that all three Kampo medicines significantly inhibited hydrogen peroxide-induced oxidative stress in human hepatocellular liver carcinoma HepG2 cells. In addition, Tsudosan significantly increased the serum biological antioxidant potential values when orally administrated to mice, indicating that it also had in vivo antioxidant activity. The potent antioxidant activity of Tsudosan may be one of the mechanisms closely correlated to its clinical usage against blood stasis. This investigation was supported by JSPS KAKENHI 15K08003, and the Joint Research grants of Toho University Faculty of Pharmaceutical Sciences.